Hey everyone! Upasana - our funny medical student made a simplified video on CAR T cell therapy. Check it out! Let us dissect this Multiple choice question. Read the question one more time and let's follow up. Put your Sherlock holmes hat and let's see what we can deduce! 1) A 4 year old kid. 2) Toxic due to dehydration. 3) In his right hip we have - Flexion, abduction, and external rotation. This collectively is called as FABER! Big clue here. Looking at the option given, we can definitely eliminate dislocation of hip. It has FADIR - Flexion, Adduction and internal rotation. Now two options left - Transient synovitis and Septic arthritis. Well you know Septic arthritis is an emergency condition. Even if you don't know any thing about other option, you can still get it correct. Child is toxic and absent movements points out toward emergency condition. A-Arthroscopy which is USG guided. Wait! 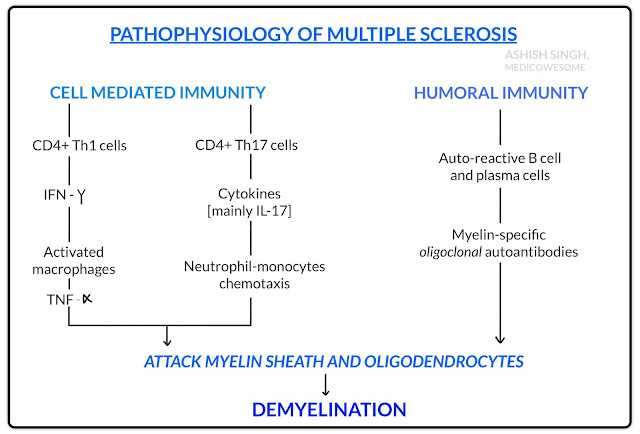 What would be treatment modalitis for both of them? Whereas Transient synovitis as name suggest is less severe so we do conservative treatment. 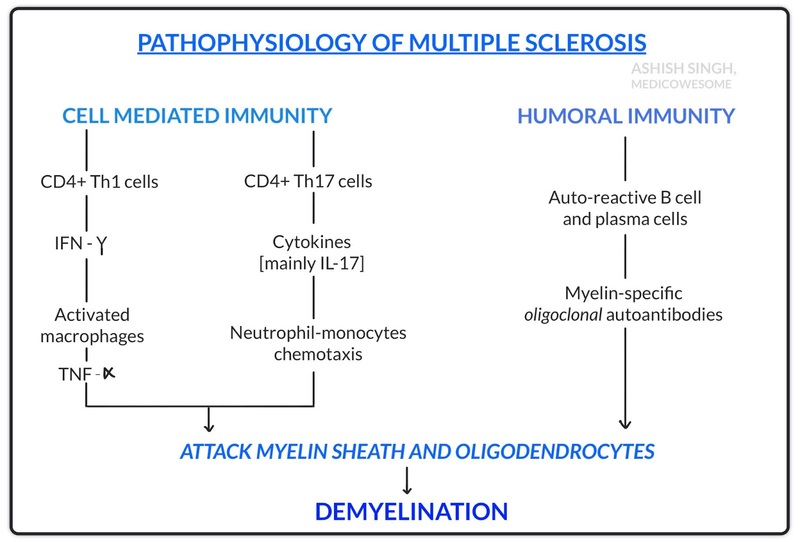 Despite the high prevalence of migraines, the underlying pathophysiology is poorly understood. Cerebral and meningeal arteries dilatation. Now largely disproven. - MRI says episodic cerebral edema with dilatation of intracereberal vessels and less water diffusion that doesn’t respect vascular territories. - PET says it’s a subcortical disorder affecting modulation of sensory processing. - Magneto-EncepaloGraphic (MEG) scan suggests failure of inhibitory circuitry in the visual cortex. - Hormones play a role. Migraines occur just as commonly in males as in pre-pubertal and post-menopausal females but the ratio tilts towards women of reproductive age group by 3:1. About half of the women complain of migraine synchrony with menses. - 5-HT overload as suggested by its metabolites in the urine. While the exact significance is controversial, the efficacy of Triptans (5-HT 1b/1d agonists) supports its role. - Trigeminal nerve dysfunction suggested by blockade of trigeminal nerve impulses by Triptans. They also inhibit release of substance P and pro-inflammatory neuropeptides. This is what we know so far. To thread this string is your responsibility, future Dr. Neurologist. Good luck! 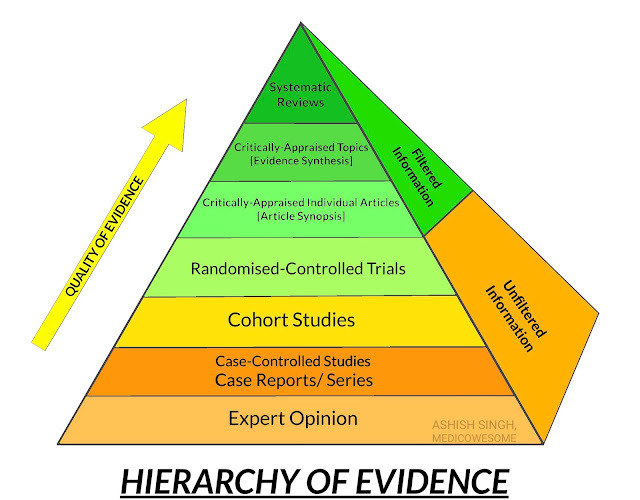 Evidence-based medicine is the conscientious and judicious use of current, best research evidence to optimise management plans. Here’s the order of importance. Here's a conversation I had with a friend of mine. She's a resident in a busy government hospital in Mumbai. I still feel like Jon Snow (I know nothing). I feel like I'm stuck at the basics. And seniors expect a lot. It is somehow unfathomable to me that someday I will be even one tenth as smart as them. Morning rounds as a massacre. It's like beheading my already non existent self confidence. I feel so stupid everyday. I have no energy to study. I'm trying so hard to not let it get to me but everyday I get to hear criticisms either from professors or immediate seniors. I wasn't born stupid Nakeya but everyday I feel like I've bitten off more than I can chew and chosen a career that's too difficult for me. I feel thoroughly demotivated these days. Like I'm just working because I have to. I feel like I've lost interest only to improve and be better everyday. It's OKAY to feel stupid. I think it's everyone of us. It's a part of learning. Indian culture has not developed a way to give constructive feedback... So you got to modify the words they say and take it in a way that motivates and inspires you. It's... I'm pretty sure it's just the culture that makes you feel more stupid than you should feel. The career is not difficult. The training is. You're not stupid. The way they teach is! We do this thing every week - We share our humanistic experiences with everyone. It could be as simple as holding grocery bags for an old lady. It really helps. We tend to think about the things we did wrong and belittle ourselves. But we need to think about the good things we did. The things we did right. Made a baby smile when they were sick. Made a correct medical decision. Got the IV in the first go. We need to celebrate the little things. Take time off from medicine and rest whenever you get a chance. 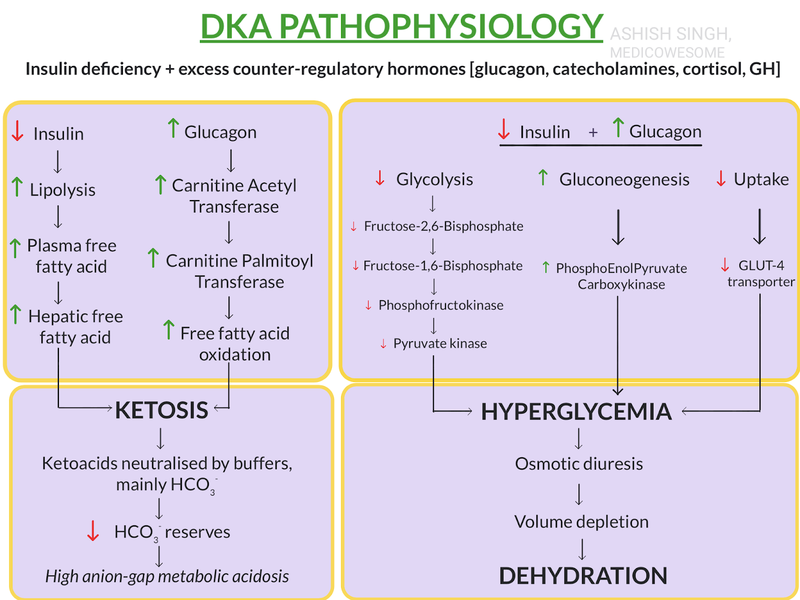 Hello guys, here’s a whiteboard summary of how DKA happens. - DKA is a medical emergency. It’s a complication of type 2 diabetes. 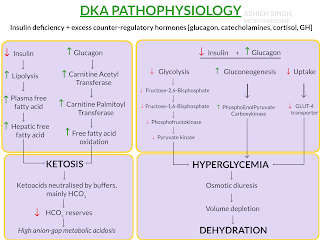 - DKA has a triad of hyperglycemia, ketosis [metabolic acidosis] and dehydration. - Main ketone bodies are beta-hydroxybutyrate and acetoacetate. Acetone is only a minor ketoacid. - Lactic acidosis also contributes to metabolic acidosis. - More glucose in blood leads to more glucose filtered into urine causing osmotic diuresis. A series of fortunate events - including a cancelled holiday and an unpredictable British summer - in 1928 began the antibiotic revolution, when Alexander Flemming’s observation that a contaminating Penicillium colony caused lysis of Staphylococci. Here’s a pictorial summary of various sites of action of modern-day antibiotics. 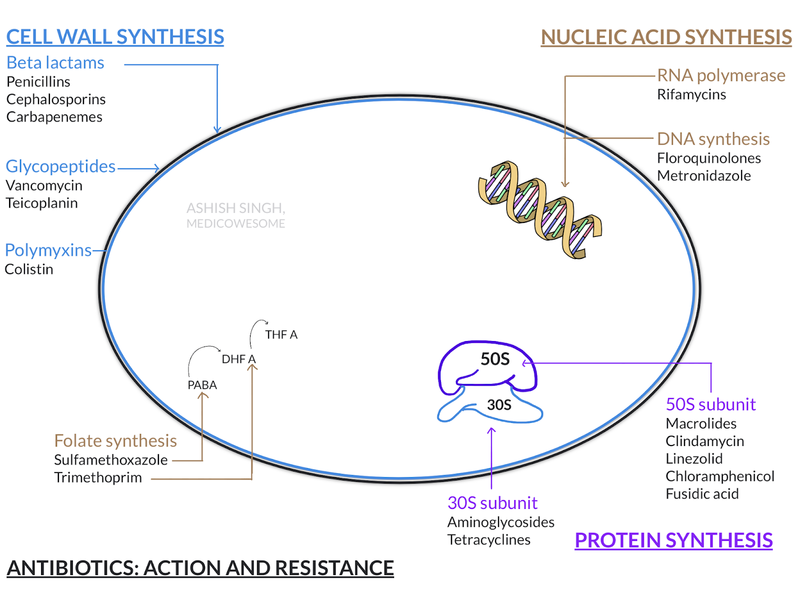 However, the capacity for prokaryotic bugs to develop resistance far outweighs the human capacity to develop new antiobiotic drugs. - Intrinsic: Inherent structural or functional characteristics, eg: vancomycin cannot cross the outer membrane of Gram negative bacteria. - Extrinsic: Acquired through years of mutation and/or transfer of resistance properties. This evolutionary phenomenon is accelerated by selection pressure from antibiotic use, eg: beta lactamase producing Gram positive bacteria. Humans are the most exquisite devices ever made for experiencing pain; the richer our inner lives, the greater the varieties of pain there are for us to feel. As physicians, never forget how painful pain is, nor how fear magnifies pain. Try not to let these sensations, so often interposed between your patient and recovery, be invisible to you as he/ she bravely puts up with them. - ALWAYS GO UP THE PAIN LADDER, IF PAIN PERSISTS/ INCREASES. 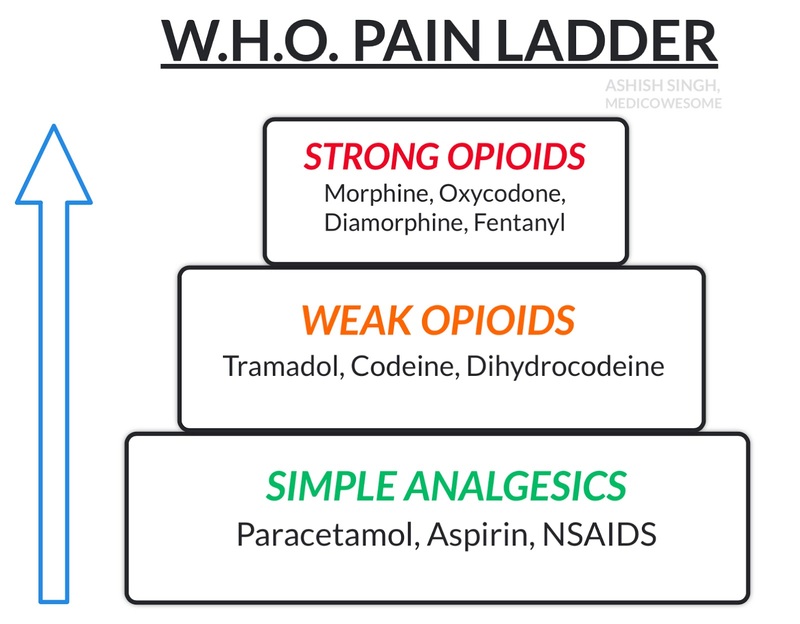 - Simple analgesics are non-narcotic. 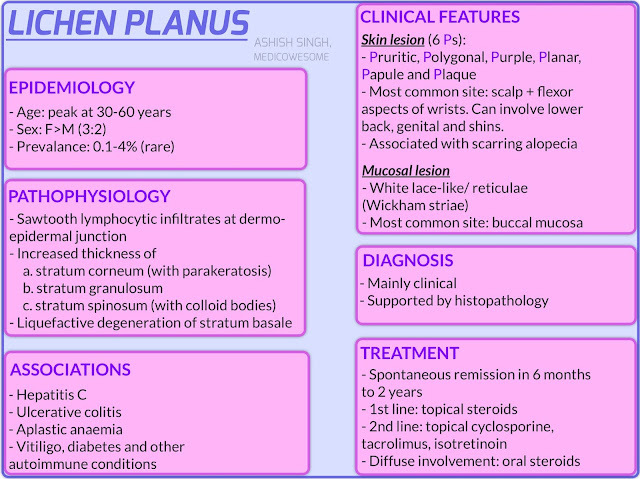 - Review and chart each pain carefully and individually. - Identify and treat underlying pathology, wherever possible. Hey guys, here’s a simple little mnemonic to remember the incubation period of various hepatitis infections. Pay attention to the order of Hep infections from 4 to 8. Why A&E first? That’s because they enter through the mouth (feco-oral mode of transmission) and your mouth is the first part of your GI. Remember Hep D co-infects or super-infects Hep B. Everything else will cause ↑ A-a gradient (e.g. shunt, V/Q mismatch, etc.). It's much better to remember the exceptions, then everything else becomes the rule! A-a gradient >30 is considered elevated regardless of age. Lung biopsy in Ventilator-associated Pneumonia may be reserved for patients in whom infiltrates are progressive despite antibiotic therapy or patients in whom a non-infectious etiology is suspected. The purpose of acquiring tissue under these circumstances is to identify a pathogen that may have been missed with previous sampling or a pathogen that is difficult to culture (eg, fungus, herpes viruses) or to identify a noninfectious process masquerading as infection (eg, cancer, cryptogenic organizing pneumonitis, lymphangitis, interstitial pneumonitis, vasculitis). But there are somedays you just get home or to hostel from medschool or hospital, and you just don't want to do it anymore. You feel like your passion is lost. You feel like you are no more yourself! YES! We all have gone through this at least once or even more times in our lives. And when you say this, many other medical students will relate to you too. Whenever you feel so demotivated, just think WHY YOU STARTED THIS AT THE FIRST PLACE? Did you do it by your will? What made you decide this? For an example, I always wanted to be a doctor, but my will to become a doctor became so strong when my grandpa passed away in a govt hospital because the doctor in charge didn't diagnose that he was having a heart attack. That day I decided I want to be that doctor who will correctly diagnose and treat people to the best capability I can. I wanted to stop anyone else's family member to pass away because of gross incapacity of a doctor. You may also have a reason like this if you dig inside your mind. And you will find this reason to fire you up again. To make you push through that one more chapter. Go to that one more ward with a wide smile despite you are sleepless and tired. Find your reason to stay, not to leave! Because once you are on this voyage, you have decided to work for the betterment of the world and the people, and if you quit midway, it's such a waste, my friend! Many people dream to be in our shoes. If we give it up, we just are ruining a chance of someone else to be a doctor. So make that medschool seat you owned, be worth it. Another thing! Going through medschool is not a single man's job. It needs hell load of a support. Find this support system in your family, in your significant other, in your friends, and anyone who would give you strength to carry on, and someone who would motivate you, someone who would be there to say "You can do this! I'm with you!". Medical books are boring, but books are not the only way you can learn anymore in this digital world. You have millions of videos and interactive websites you can find. You have blogs like our www.medicowesome.com where we breakdown big medical info into small pieces and clarify. Get your stuff together, clean up your workspace. Cleaner table will motivate you to study too. Use some motivating words in front of your workspace, On your phone's wall paper, On your notebooks! Simply everywhere you would see. If someone would judge you for that, make them your motivation too. Stick up a motivating note on their forehead too!  Just kidding! Ya just keep that smile on always! Life is great! Medical life is even greater! With all its failures, late night cries, exam phobhias, senior bullies, colleague dramas, its all worth it. Finish your degree...! This pain lasts only few years! Once you are a fully fledged doctor, you can go ahead and be that wonderful human being you always wanted to be! Don't kill that wonderful person even before you get there!! We are all voyagers of this same hard journey wherever we are in this world! So let's do this! 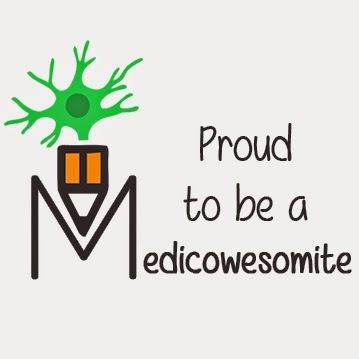 And in any case you need someone to guide you through your academic related depression or demotivation, always count on us here in Medicowesome! Good luck! See ya later! Talking about my hobbies,I love Sci-Fi and fantasy movies (Huge fan of MCU too :P). I'm obsessed with Game of Thrones, Breaking bad and House MD💙. I love dogs, especially Samoyed😍. Thanks IkaN for giving me this opportunity! I love making new mnemonics and writing articles for this blog!! I hope you'll enjoy reading my articles.